Ladybug tattoos are definitely cute, but are they the right design for you? Find out a little more about the meanings attached to these beautiful insects, as well as some ideas for your own original tattoo. 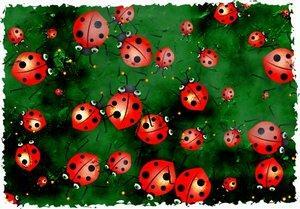 One of the most popular folklore stories attached to ladybugs is that it's good luck for one to land on you. So, does that mean you'll enjoy even more luck if you have one permanently tattooed on your body? Maybe, maybe not, but you'll probably look good either way. They bring you luck in love. They bring good weather with them. They can understand human language. You can make a wish on them and gently blow them away. The common thread running through all of these beliefs is that ladybugs are a positive thing, so it's no wonder that many people choose them as inspiration for tattoo designs. When you think of a ladybug, you probably imagine the classic red and black spotted insect. 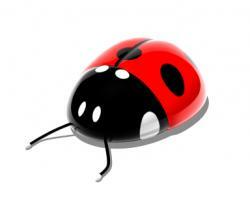 However, there are many different kinds of ladybug-like insects, and they come in various colors. That said, you don't have to limit yourself to realistic colors. Feel free to explore the rainbow. If a blue bug with green polka dots inspires you, by all means, have your design inked this way. Like the idea of a paisly ladybug? Go for it. Play around with some markers to find color combinations you really love. Your tattoo artist will let you know if the colors you choose will look good inked on your particular skin tone. The great thing about ladybug designs is that they fit so well into just about any nature theme. The also go well with basic shape designs. You can easily add them to existing tattoos to freshen things up. Ladybugs also look terrific as part of a tribal tattoo design. Just imagine one incorporated into an arm band or lower back tattoo. A design like this is less cute than the average ladybug design, so it may age with you better. You should also consider a variety of body placements for your tat before you commit to ink. Would you like a ring of ladybugs as an ankle or wrist bracelet? What about a floral motif with a few ladybugs as part of a half sleeve tattoo? With a little experimentation, you may think of places and ways to wear your tat that you never considered before. Sometimes it's better to give a cutesy tattoo a trial run to make sure you like it on your body as well as you liked it on paper. It's possible to really like a design, and yet not have it truly fit your character. By wearing your design as a temporary tattoo, you decide if it really suits you , and if it's still likely to look cool as you age with it. For some excellent prefabricated temporary tattoos, there are few better places to go than Tattoo Johnny's. Johnny's specializes in temps, and you can purchase the special paper you need to download and print a trial design right from your own computer. They happen to have a great selection of ladybug tattoos in their gallery. The temps aren't expensive, so you can take your time trying a few designs until you find something that suits you. Sometimes viewing other people's tats provides a wealth of ideas for creating your own original designs. You can borrow a little here and there, add a bit of your own ideas and weave together an outstanding design this isn't quite like anyone else's. You can see more artist renditions at CreativeFan.com.